This dish is vegetarian but just-oh-so-indulgent and feels kinda meaty! Grilled eggplant has such a delicious meaty texture. It’s just perfect for those days (or weeks) when you want to skip the meat for once. And now the best news: This extraordinary guacamole makes it even better! Did you know that you can use avocado not only in savory dishes but in sweet ones as well? The subtle taste of the avocado fruit works so well as a base for vanilla and even chocolate. Ever thought of making cake frosting out of avocado with vanilla, sugar and lemon juice? Check out this and other adventurous exciting flavor combinations in my new book Flavor Math. It is available digitally (PDF) now! Are you ready for an intriguing new flavor combo that your guests will talk about for a long time? Guac’ up your vegetarian life! Cut the eggplant lengthwise into 1cm thick slices. Cover with olive oil and seasons with salt and pepper. Put a griddle pan on high heat and wait until it starts to smoke. Place eggplant slices in the griddle plan but make sure they do not overlap. You may need to do this in 2 batches. Let them sit in the pan for 3 minutes until well charred. Flip the slices over and griddle on the other side for another 2 minutes. Remove from the skillet and store them on a plate while you make the guacamole. Cover with aluminum foil. Finely dice the red onion, slice the pepper into fine rings and roughly chop the cilantro. Put them all in a small mixing bowl, together with the drained sweet corn. Peel and deseed the avocado. Scoop the flesh into the bowl and immediately add the lime juice. Season well with salt and pepper. Stir the guacamole with a fork to break up the avocado. Make sure all ingredients are well-combined but still chunky. Crumble the blue cheese over the guacamole. Chop the walnuts and sprinkle on top. Serve the grilled eggplant with dollops of the guacamole, drizzle with any remaining cooking juices from the eggplant. Dig in! What is your favorite way to prepare eggplant? 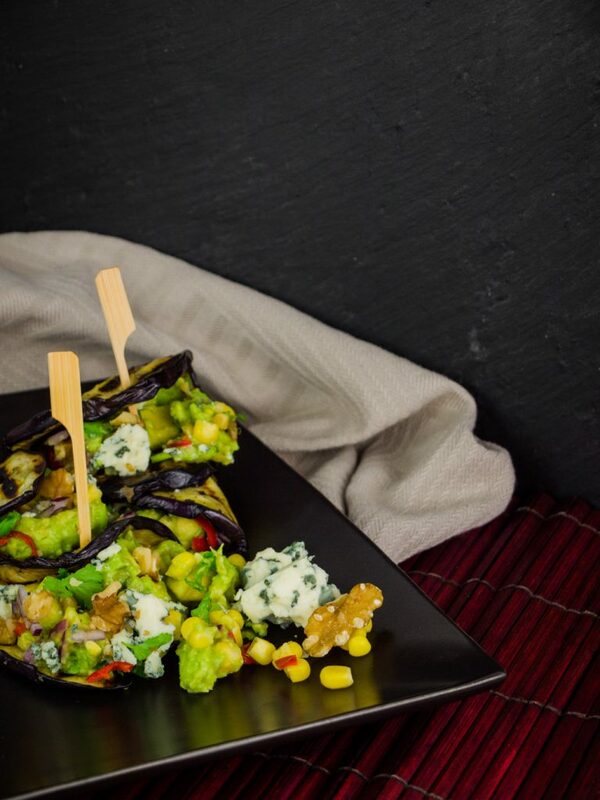 Did you ever try guac’ with blue cheese before? If you have any comments or thoughts, let us know in the comments below! PS: This recipe is inspired by the idea that eggplant shares chemical flavor compounds with blue cheese, avocado, walnuts, and corn. That’s why they work so well together. Check out James Briscione’s book The Flavor Matrix on food pairing if you are interested in digging deeper into this!